What is behind your choice of this piece of art in response to the topic “Guns in American Culture”? Artist Sandra Cohen: The over-zealous quality of gun defense by gun owners needled continuously by the fear-mongering gun lobby has become ludicrous. The refusal to see the reality of the problem, especially after so many recent gun-related tragedies, correlates in my mind with the over-zealous defense of hate by some people who believe they hear the word of God. Why did this piece of art resonate for you or seem like it would give you an avenue into writing about this subject? 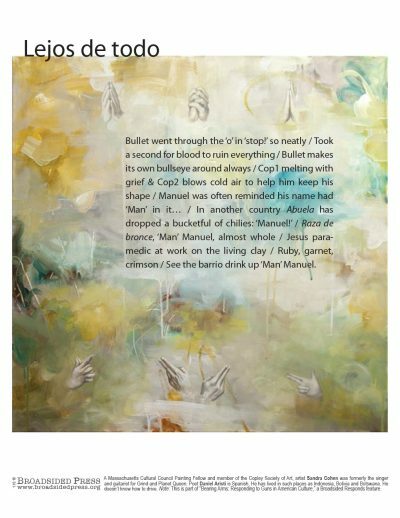 Poet Daniel Aristi: I was first drawn towards the hugely dissimilar meanings that the various sets of hands in the painting convey through what in fact amounts to very minor variations in the position of the fingers: two hands together for praying, two hands together (but with some flexed fingers) to simulate a gun. Murder or redemption – fully opposing propositions – depend on whether a couple of fingers get bent or are kept straight. I found this concept fascinating. What surprises you in the poet’s response to your artwork? Artist Sandra Cohen: I love the avant-garde quality, the mix lyricism and story. I was surprised that Daniel’s writing brought to my mind another piece I’d submitted for this collaboration, one he could not have seen! Poet Daniel Aristi: I’d say that writing and art certainly have the ability – not sure about the obligation, though – to add their voice to the political discourse of the moment. Zola’s open letter J’accuse during the Dreyfus affair in France comes to mind. As for the level of success of such a political piece of art, I would say that it needs to both contribute to the political goal it has set itself to achieve and, at the same time, it needs to be considered a good piece of art for art’s sake, irrespective of the political context. In my mind, some of the propaganda posters of the Soviet Union in the 1960s would fulfill this double aim. Artist Sandra Cohen: Something by Charlotte Gainsbourg, Massive Attack, or David Shire. Poet Daniel Aristi: I would go for a mariachi-inspired type of piece…or something from Los Lobos! Artist Sandra Cohen: The Maddaddam Trilogy by Margaret Atwood, M-train by Patti Smith. Poet Daniel Aristi: I’m halfway through Theodore Rex, the second volume of a biography of President Theodore Roosevelt by Edmund Morris, a superb read. Poetry-wise, I’m reading lots of Kaveh Akbar and Randall Mann. Artist Sandra Cohen: The Obama portraits are going to be awesome (I saw the artists Kehinde Wiley and Amy Sherald profiled in the New York Times); puzzle portraits of twins by Alma Haser. Poet Daniel Aristi: I recently visited the Ethnographic Museum of Geneva (MEG) and it has got gorgeous artifacts from all over the world. Artist Sandra Cohen: I love your mission to bring art to everyday places—very proud to be a part of it! NOTE: This broadside is one of six published for our “Bearing Arms: Responding to Guns in American Culture” special feature. We put out a call to visual artists asking for submissions. Powerful work came from all over the country, in all media. Guest Arts Editor Stacy Isenbarger selected six pieces. We then asked writers to respond in words. Many who submitted writing said they were grateful for this opportunity to engage… and to find a new way toward engagement. We hope you readers will share this special feature widely and let us know what you think. Sandra Cohen studied fine art at Parsons School of Design, the SMFA, and the Art Institute of Boston. A Massachusetts Cultural Council Painting Fellowship recipient for 2008 and a member of the Copley Society of Art, she was formerly the singer and guitarist for Boston bands Grind and Planet Queen. Image: “True Believers” 24” x 24”, acrylic on canvas. Daniel Aristi was born in Spain. He studied French Literature as an undergrad (French Lycée in San Sebastian). He now lives and writes in Switzerland with his wife and two children. Daniel’s work is forthcoming or has been recently featured in Dewpoint, decomP, Temenos Journal, and Permafrost. His prose has been included in the 2016 edition of The Best of Small Fictions anthology. Daniel is a Pushcart nominee.